Background: Extremes of body mass index (BMI) are associated with adverse pregnancy outcomes. This study was conducted to determine the prevalence of obesity and underweight among women in their first trimester and evaluate the impact of first trimester BMI on pregnancy outcome. Patients and Methods: Pregnant women who booked in the first trimester of pregnancy in Aminu Kano Teaching Hospital, and met the inclusion criteria, were studied retrospectively for a 3-year period from January 2012 to December 2014. Their booking BMIs were calculated and categorized using WHO classes. Pearson's Chi square test was used for all categories. Results: A total of 649 pregnant women booked in the first trimester during the study period, out of which 502 were eligible for the study. Of this, 99 women were obese and 57 were underweight giving the prevalence of obesity and underweight in first trimester of pregnancy as 15.3% and 8.8% respectively. Maternal outcomes mostly associated with obesity and overweight were hypertensive disorders in pregnancy (42.0%), gestational diabetes mellitus (41.3%), increased abdominal and instrumental delivery (38.6%), as well as third and fourth degree perineal tears (71.4%). Neonatal outcomes were low birth weight and fetal macrosomia (57.8%), preterm delivery and prolonged pregnancy (46.0%). The underweight group had a favorable outcome in majority of the outcomes assessed. Conclusion: Obesity in pregnancy is relatively common in our environment and is associated with adverse fetomaternal outcome when compared to the underweight subjects. There is a need for preconception care and further research to identify and possibly mitigate the risk factors of obesity. Undernutrition with the consequent underweight is still prevalent in developing countries, leaving these parts of the world with the consequences of both obesity and underweight.,,, In India for example, obesity was reported in about 12.6% of pregnant women, with 21.04% being overweight and 14.79% being underweight in a nationwide study. In Nigeria, the prevalence of obesity and overweight in pregnancy has been reported respectively to be 33.1% and 32.5% in North-Central regions; 10.7–22.6%, and 14%, in Southeast; 9.63%, and 50.7% in the South-South; and 12.6% and 20.3%, in Southwestern part of the country. Amongst Utah women of southwest Nigeria, about 7.3% were reported to be underweight. An increased association of morbidity and mortality with obesity is well established in both nonpregnant and pregnant women reflecting an increased risk of medical, surgical, or anesthetic complications.,, Obesity confers a high-risk status to pregnant women in particular, and a high proportion of women who die in pregnancy or postpartum are obese.,,,, The confidential enquiry into maternal death  reported that 35% of all maternal deaths in 2000-2002 were obese women having BMI ≥ 30kg/m 2. Other adverse neonatal outcome associated with obesity include miscarriages, stillbirth, congenital anomalies, and neonatal intensive care admission.,,, Others include low 5-minute APGAR score, fetal macrosomia, abnormal lie, and malpresentation and neonatal deaths.,. This study adds to the literature on the subject, and reports on indices for which we have no recent values for Kano, Nigeria. Also, this study population will be more representative of the general population in our environment since Aminu Kano Teaching Hospital (AKTH) serves as the referral Centre for the North West and some of the North East regions. The study was therefore conducted to determine the prevalence of obesity and underweight and evaluate the impact of first trimester BMI on pregnancy outcome in patients attending AKTH. This was a 3-year retrospective study of women in the first trimester of pregnancy who booked for antenatal care (ANC) in Department of Obstetrics and Gynaecology of AKTH, Kano, Nigeria from January 2012 to December 2014. AKTH is a 500 bed tertiary health institution serving Jigawa, Katsina, Zamfara, Kebbi, Kaduna, and Sokoto states in Northwestern Geopolitical zone of Nigeria. The 2014 AKTH annual report put its ANC attendance and delivery rates at 4000 and 5000 respectively. Kano State lies between latitude 12°00 North and longitude 14°31 East. It is the second largest city and is located in Northern Nigeria. According to 2006 population census, the population of Kano city was 2,282,861 and for the entire state was put at 9.6 million. The ethical clearance was obtained from the Research and Ethical Committee of AKTH. Following ethical approval, the booking register for this period was retrieved from the health records department of Obstetrics and Gynaecology of AKTH from which the patients' names and hospital numbers were obtained. Only pregnant women booked in the first trimester were included in the study since weight gain in first trimester is negligible ,, and other trimesters are associated with significant weight gain from the fetus, placenta, and liquor, as well as changes in the uterus, breast, blood, extracellular fluids, and fats., The gestational age at booking was gotten either from the recorded last menstrual period when available or from the early ultrasound scan. Among those who booked in the first trimester, those with incomplete data as well as high-risk patients were excluded, including those with multiple pregnancies, previous cesarean section and those with chronic medical conditions such as chronic hypertension, pregestational diabetes mellitus, and sickle cell disease patients. Those in whom episiotomies were performed were also excluded since perineal tear, second degree inclusive which is like episiotomy was one of the maternal outcomes assessed for. The booking register was used to retrieve the medical case records of those who met the inclusion criteria for the study. From these records, sociodemographic data (age, parity, ethnic group, and occupation) and maternal anthropometric data (weight in kg and height in meters) were obtained. The maternal anthropometric data were used to calculate the BMI in kg/m 2. The BMIs are grouped into six according to WHO classification. The group with the BMI in the normal range (18.50–24.99) was used as the reference group for analysis. The maternal outcomes assessed included hypertensive disorders in pregnancy, gestational diabetes mellitus, prolonged labor, cesarean section, instrumental vaginal delivery, perineal tear, and primary postpartum hemorrhage while the fetal/neonatal outcome assessed included miscarriage, preterm delivery, prolonged pregnancy, fetal macrosomia, low birth weight, APGAR score <7 in the 5th minute and early neonatal deaths. Microsoft Excel for MAC 2011 was used for all mathematical calculations and data entry, and analysis was done using SPSS version 20, (SPSS Inc, Chicago, IL USA). The descriptive statistics was done where necessary and Chi square test was used to identify association between qualitative variables and BMI. P value <0.05 was considered as statistically significant. Results were presented in tabular forms. A total of 649 pregnant women were booked for their antenatal care in the first trimester during the study period, out of which 502 (77.3%) were eligible for the study. The mean maternal height was 1.62 m ± 0.08, the mean maternal weight was 66.108 kg ± 16.78, the mean maternal BMI was 25.077 kg/m 2 ± 6.1, and the mean maternal age was 25.89 years ± 5.4, ranging from 16 years to 45 years. Of this number eligible for the study 57 (11.4%) cases were underweight, 229 (45.6%) were of normal weight, 117 (23.3%) were overweight, and 99 (19.7%) were obese. The prevalence of obesity and underweight were thus 15.3% and 8.8% respectively. Obesity was associated with maternal age ≥36 years (75.9%), non Hausa-Fulani ethnic group (54.5%), grand multiparity (72.4%), and amongst civil servants (49.1%) P value = 0.0001 and no association with clinical risk was found among the underweight/normal weight (non-obese) as shown in [Table 1]. [Table 2] shows the socio-demographic characteristic of the study population. Majority (64.3%) of the cases were between 21 years and 30 years and majority were para 0-4, (94.2%) about two-third (71.4%) of the study population were of Hausa-Fulani ethnic group, more than half (52.0%) were housewives and 45.6% had normal weight. Maternal outcomes for the different BMI categories are shown in [Table 3]. Increased cesarean section rate and instrumental delivery were seen in obese (38.6%) and overweight (30.0%) groups compared to those with normal weight (28.6%). It was lowest amongst the underweight (2.9%), (P = 0.010). All degrees of perineal tears were commoner among cases with normal weight (39.2%), closely followed by the overweight group (30.4%). It was similar amongst obese (15.7%) and the underweight (14.7%) groups, (P = 0.0001). Primary postpartum hemorrhage was commoner in those with normal weight (37.0%) than the obese (30.7%), the overweight (27.6%), and the underweight (4.7%), (P = 0.0001). Hypertensive disorders in pregnancy were commoner in the obese (42.0%). 28.4% of overweight women, 24.7% of pregnant women of normal weight, and 4% of underweight women suffered these disorders, (P = 0.0001). Gestational diabetes mellitus was seen more in the obese (41.3%), followed by the overweight (28.3%). It was least seen among the underweight (4.3%), with 26.1% of normal weight pregnant women having the condition (P = 0.0001). Differences in packed cell volume and duration of labor were not statistically significant across the categories. Fetal outcomes for the different BMI categories are shown in [Table 4]. Abnormal fetal weight (weight <2.5 kg and those ≥4 kg) were seen more (57.8%) in overweight/obese group compared to those with normal weight (35.9%) or underweight group (6.3%) (P = 0.031). Also, preterm and postdate pregnancy (<37 weeks and >40–42 weeks respectively) were increased (46.0%) in overweight/obese group compared to women with normal weight (42.1%) or underweight women (11.9%) (P = 0.048). Fifth minute APGAR score and miscarriage, and early neonatal death were not statistically significant across the BMI categories. The result of this study emphasizes obesity as an emerging pandemic amongst pregnant women, and Kano state is not spared. The prevalence of 15.3% reported in this study is comparable to previously published data in Nigeria and India., This is not surprising as Kano state, being a merchant city, is a melting pot of all ethnic groups in Nigeria, as well as non-Nigerians. AKTH serves as a referral center for most states within the northwest region, and so, values are expected to be representative of the wider Nigerian population. The prevalence of obesity reported in this study; however, is slightly lower than what has been documented in some studies in the western world., This is not surprising as majority of the Nigerian populace still live in the low resource settings and below poverty line, as Nigeria is still classified as a developing country. 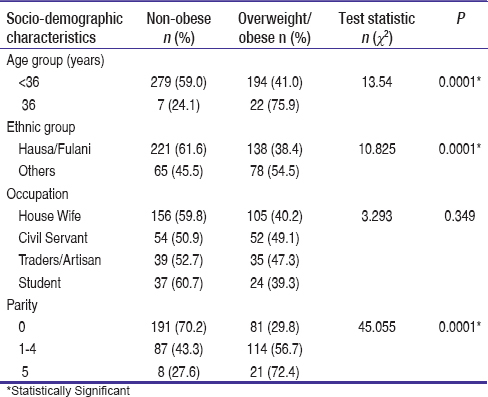 The prevalence of overweight pregnant women in this study is similar to result of other studies within and out of Nigeria.,, The prevalence of underweight in this study, though similar to that seen in southwest Nigeria,, is however, lower than that seen in North Central Nigeria  and outside Nigeria, including India. This might be an incidental finding and may need further exploration. This study also identified civil servants to be more at risk of being overweight or obese. This may be attributable to the sedentary nature of their professions (longer sitting periods), long periods spent at work, as well as an increased likelihood to consume “junk food” including soda drinks and pastries. These soda drinks and frequent snacking on pastries have been shown to be associated with increased weight gain. This study also shows that maternal obesity and overweight are associated with adverse obstetric outcomes. The significant association between being overweight or obese in pregnancy, and hypertensive disorders and gestational diabetes mellitus in pregnancy seen in this study is similar to previously published data.,,,,,,,,,,,,,,,,, Increased cesarean section rate and a recourse to instrumental delivery were also seen in these two groups compared to those with normal weight or those that were underweight, probably due to increased medical disorders in these patients, and the increased fetal macrosomia that predisposes to cephalopelvic disproportion. That all degrees of perineal tears were more common amongst normal weight individuals may be related to less attention paid to low-risk patients in labor, and not their BMI category, as multiple women undergo labor concurrently, and with the manpower challenges prevalent in the Nigerian health sector and in AKTH, effective attention per woman is limited. This is compared to obese or overweight women, who have the attention of the attending doctor in labor thereby preventing perineal tears. Among the obese women that had perineal tear; however, majority (71.4%) had 3rd to 4th degree tears. This trend is similar to observations documented in literature ,, and could be due to increased frequency of fetal macrosomia or instrumental vaginal delivery. Primary postpartum hemorrhage was significantly increased in those with normal weight. This is surprising as several studies document increased primary postpartum haemorrhage in the overweight or obese.,,,,,,,,,, This is probably due to less attention paid to this category in labor as highlighted earlier. In this study, those who were overweight and obese delivered more low birth weight and macrosomic babies. This trend is similar to observations documented in literature ,,,,,,,,,, and may be due to an increased risk of diabetes mellitus and hypertensive disorders in pregnancy in this group also. These co-morbidities may predispose to fetal macrosomia and/or intrauterine growth restriction. The preterm and postdate pregnancy was also significantly increased in the overweight and obese group. Similar findings are reported in the literature.,,,,, The increased risk of preterm delivery in the obese may be iatrogenic, as increased prevalence of medical conditions in the mother or fetal macrosomia and intrauterine growth restrictions of the baby may warrant early interception by attending physicians. Increased low birth weight, stillbirth, and spontaneous preterm delivery might also be due to dysregulation of proinflammatory cytokines as well as increased risk of infection in obese and overweight individuals as they will lead to reduced placental surface area and also their vasculature with consequent uteroplacental insufficiency. Our retrospective study may have been limited with problems of data storage and retrieval. The short duration of the study (3 years) may not reflect the changing trends in population of pregnant women adequately and so the subject needs to be studied prospectively for a longer period. Some of the outcome measures assessed and BMI categories were scientifically merged in order to get valued results, this may have shown a better reflection of the findings if left to stand separately. Obesity and underweight in early pregnancy is high in Kano state and its environs. While underweight had a protective effect on most of the outcomes assessed, obesity and overweight were associated with adverse fetomaternal outcomes. Normal weight pregnant women can also be associated with adverse outcomes when they are not properly managed, therefore need adequate management to remain healthy. Obesity was found to be associated with increased parity, age ≥36 years, non-Hausa Fulani and being a civil servant; however, no association was found with underweight. This warrants further study. Preconception care including good and adequate diet, weight loss, exercise as well as family planning to reduce family size and also to enhance proper child spacing is advocated for all obese and overweight women so as to minimize risks and its associated consequences. Further research is required to identify the risk factors of obesity and ways of mitigating them. A prospective study on this subject matter is needed to obviate the limitations associated with data storage and retrieval. Anzaku SA, Achara AP, Akaba GO, Yakubu EN. 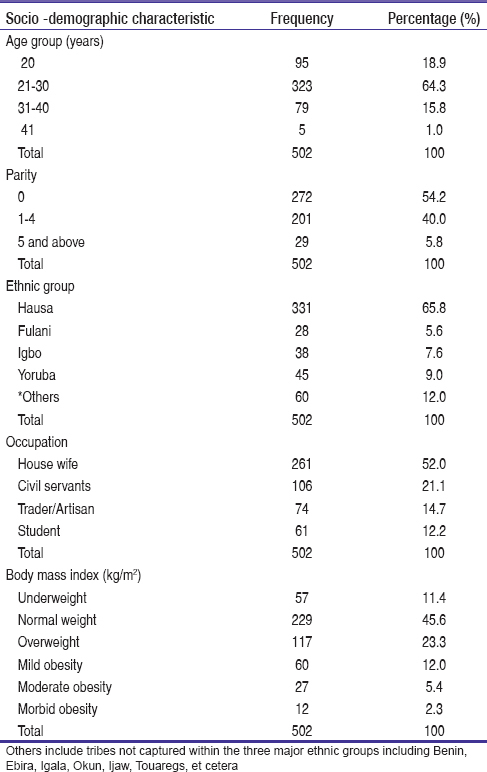 Prevalence and risk factors for obesity in a Nigerian obstetric population. American Journal of Health Research 2014; 2 (5): 229-233. Ugwuja EI, Akubugwo EI, Obidoa O, Ibiam AU. Maternal BMI during pregnancy: Effect on trace elements status and pregnancy outcomes. Int J Health Res 2010; 3 (2): 71-73. Esimai OA, Ojofeitimi E. Pattern and determinants of gestational weight gain an important predictor of infant birth weight in a developing country. Glob J Health Sci 2014;6:148-54. Anzaku SA, Ogbu GI, Ogbe AE, Obodo K. Impacts of obesity on maternal and foetal outcomes in women with singleton pregnancy at a Nigerian clinical setting. BJMMR 2015;6:1159-65. Jeminusi OA, Sholeye OO, Abosede OA. Maternal anthropometry in rural and urban areas of ogun-east senatorial district, Nigeria: A comparative study. Int. J Nutr Metab 2015; 7 (3): 39-45. Anjana V, Lalit S. Maternal Body Mass Index and Pregnancy outcome. J Clin Diagn Res 2012;6: 1531-3. Shahla Y, Yousofreza Y, Bahman H N, Mohsen HM, Zinatossadat A. Effect of maternal body mass index on pregnancy outcome and newborn weight. BMC Research Notes 2012;5:34-7. Scott-Pillai R, Spence D, Cardwell CR, Hunter A, Holmes VA. The impact of body mass index on maternal and neonate outcomes: A retrospective study in a UK obstetric population, 2004-2011. BJOG 2013;120:932-9. Bhattacharya S, Campbell DM, Liston WA, Bhattacharya S. Effect of Body Mass Index on pregnancy outcomes in nulliparous women delivery singleton babies. BMC Public Health 2007; 7:168. Klufio CA. Obesity in pregnancy in: EY Kwawukume and EE Emuveyan (eds). Comprehensive obstetrics in tropics, 1st edition Accra, Ghana, Asante and Hittschner printing press limited, 2002; 219-224. Usha Kiran TS, Hemmadi S, Bethel J, Evans J. Outcome of pregnancy in a Woman with an increased body mass index. BJOG 2005; 112: 768-772. Ian T. Obesity in pregnancy. In: John Studd. Current Progress in Obstetrics and Gynaecology. Vol 4. Edinburgh London: Churchill Livingstone; 1984. p. 127-136. Modi N, Murgasova D, Ruager-Martin R, Thomas EL, Hyde MJ, Gale C, et al. The influence of maternal body mass index on infant adiposity and hepatic lipid content. Paediatr Res 2011;70:287-91. Li N, Liu E, Guo J, Pan L, Li B, Wang P, et al. Maternal prepregnancy body mass index and gestational weight gain on pregnancy outcomes. PLoS ONE 2013;8:e82310. Sebire NJ, Jolly M, Harris JP, Wadasworth J, Jofte M, Beard RW, et al. Maternal obesity and pregnancy outcome: A study of 287,213 pregnancies in London. Int J Obes Relat Metab Disord. 2001;25:1175-82. Tsai IH, Chen CP, Sun FJ, Wu CH, Yeh SL. Associations of the pre-pregnancy body mass index and gestational weight gain with pregnancy outcomes in Taiwanese women. Asia Pac J Clin Nutr 2012;21:82-7. Nurfazlin R, Hayati A, Mohd A M, Siti S A, Ajau D, Khairil -Anuar M I. The Association of Gestational Weight Gain and the effect on pregnancy outcome defined by BMI Group among Women Delivered in Hospital Kuala Lumpur (HKL) Malaysia: A Retrospective study. Asian Journal of Clinical Nutrition 2012; 4: 160-167. Margaretha H, Anne L B, Anna W, Lauren L, Jan A, Bente O,et al. Associations of prepregnancy body mass index and gestational weight gain with pregnancy outcome and postpartum weight retention: A prospective observational cohort study. BMC 2014; 14: 201-212. Hu FB. Are refined carbohydrates worse than saturated fats? Am J Clin Nutr 2010;91:1541-2. Aune D, Saugstad OD, Henriksen T, Tonstad S. Maternal body mass index and the risk of fetal death, stillbirth, and infant death. JAMA 2014;311:1536-46. Vartanian LR, Schwartz MB, Brownell KD. Effects of soft drink consumption on nutrition and Health: A systemic review and meta-analysis. Ann J Public Health 2007;97:667-75. Li N, Liu E, Guo J, Pan L, Li B, Wang P. Maternal pre-pregnancy body mass index and gestational weight gain on pregnancy outcome. PLos ONE 2013;8:82310.